SinoHosting.net Review 2019: Is SinoHosting.net a Good Hosting? SinoHosting.net is a great option for any company looking to use Chinese servers with English language support. Their one-click WordPress integration is great, but smaller companies will find their price point to be a little high. SinoHosting.net is the only China-based web hosting company to offer English language support. Founded in 2007, they currently host over 10,000 web, email, and server accounts. They also partner with a hosting group that has a specific e-commerce focus. 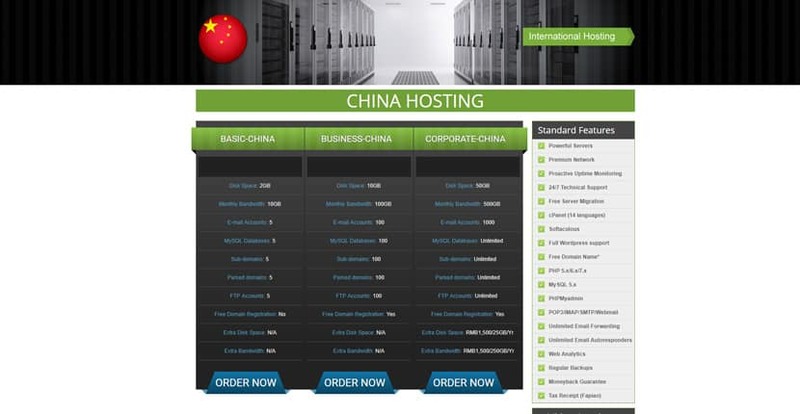 SinoHosting.net offers different plans for web hosting with servers based in China, Hong Kong, Taiwan, Korea, Singapore, the United States, and Europe. They offer one-click integration tools for all the most well-known and popular extensions including WordPress and Magento. One of the unique features SinoHosting.net brings is their access to servers within China. For webmasters operating websites with a large Chinese clientele, this is a huge upgrade over hosting options in North America or Europe. Not only will the load times for visitors from mainland China will be significantly faster, but you’ll also benefit from a rankings boost in Chinese search engines. That access — along with English language support options — is a significant strength for SinoHosting.net. All entry-level international plans allow a single hosted domain and do not come with free domain registration. However, going for their higher-tier plans will increase this to up to ten hosted domains and net you a free domain. SinoHosting.net performs “proactive uptime monitoring,” but doesn’t guarantee a specific percentage of uptime. Also, all plans require you to purchase SSL certificates separately, unfortunately. SinoHosting.net’s pricing is geared towards users looking to reach out to the Chinese market. Despite a feature list that’s similar or even slightly smaller than competitors, their entry-level plans cost several times that of their competition. However, the speed and memory offered by the higher-tier plans are similar to what you’ll find elsewhere, and although the price is still slightly high, it’s much closer to what you’ll see elsewhere. What’s excellent is the value to price ratio between the low-end and high-end price points. For both the international and China-based server plans, there’s a 25x increase in disk space and a 50x increase in monthly bandwidth between the two plans — but only a four to five times increase in price. It’s a great deal for higher-end customers that need all that power. One pricing nuance to consider for merchants of all sizes is the ability to get English language support for a web hosting company with servers based in China. If you’re a merchant that does a lot of business in the Chinese market or even Asia generally, the amount you’ll pay to be close to your customers while also being able to work in English is a bargain. SinoHosting.net boasts a multi-cultural team, and my contact with their phone support staff bore that out. They were helpful, friendly, and answered all my questions expertly. I got a response to my email within 48 hours — slow by web hosting standards, but passable. However, there’s no live chat option. Of course, Chinese language support is also available if you want it. onClick="trackClickout('event', 'clickout', 'Vendor Page - Visit User Reviews', 'SinoHosting.net', this, true);"
Slow servers especially for Chinese market. Slow support, within accurate answers. It was good service before some years, now not even worth a try. SinoHosting.net is a great option for any size company doing significant business on the Chinese mainland or within Asia. However, for non-Chinese web hosting, the price is a bit too high to be truly competitive. Wondering how SinoHosting.net stacks up against other Web Hosting companies? Enter any other Web Hosting company and we will give you a side-by-side comparison.